Disposable vinyl gloves are a looser fit, available in powdered and non-powdered, are latex free, available in sterile and non-sterile, with a range of sizes. 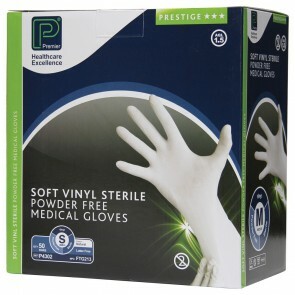 Disposable vinyl gloves are an excellent choice for those needing protection from incontinence leaks and spillages but at a lower price. The gloves are a looser fitted style than other gloves available but still fit the contours of the hand extremely well. Our range of disposable vinyl gloves are available in powder or powder-free styles. Powdered gloves are easier to put on and take off. The gloves are latex-free, but please check manufacturer’s instructions when you are wearing them for the first time. The range includes sterile and non-sterile options. Vinyl gloves are available in either blue, clear or white colours. Certain products comply with Medical Device Directive EN455 and AQL1.5 and are of a premium medical grade quality. The gloves are available in sizes ranging from Small, medium, large and extra-large. Vinyl gloves are the economical option but with excellent protection and available in a range of sizes and options.